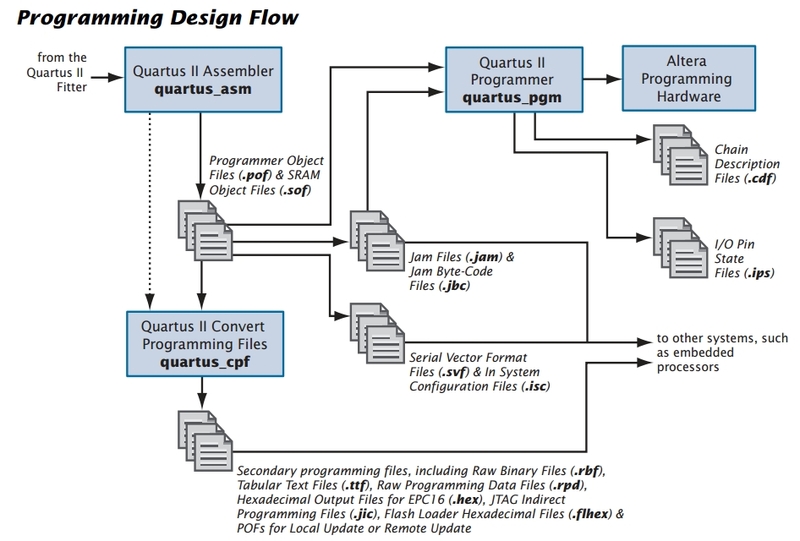 Quartus II is the development tool for the full range of Altera FPGAs and CPLDs, a free edition of the software is available to download from the Quartus II Web Edition webpage. The software is continually being updated as new Altera devices are developed, at each software release, support for some legacy devices may be dropped. 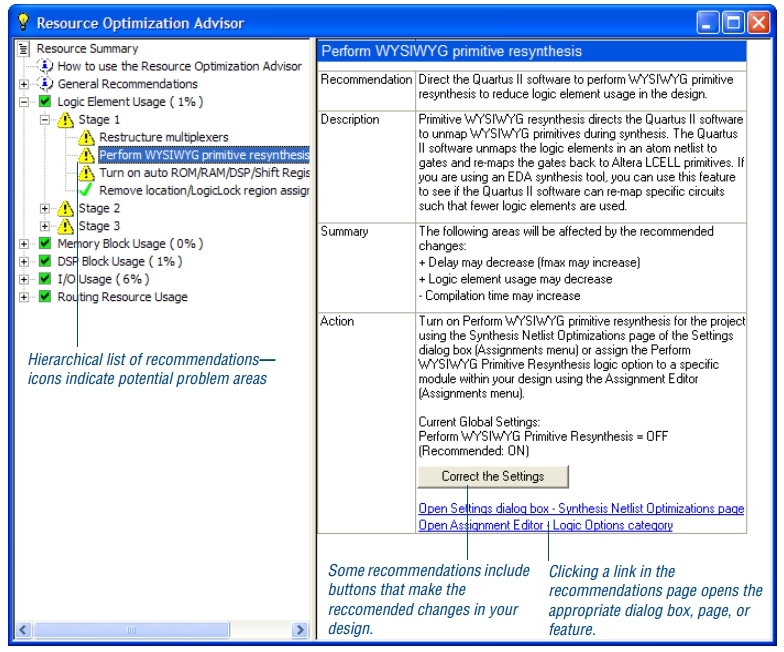 At the time of writing this page, the current version is Quartus II 13.1, the last version to support the MAX7000 family was Quartus II 13.0 SP1, legacy versions of the software are available from the Quartus II Web Edition downloads page. As might be expected, Quartus II is a very powerful and flexible tool, the downside of that power and flexibility is the complexity of the software. Altera have produced a large quantity of documentation and training materials for Quartus II, a selection of which are available for download from via the links at the bottom of this page. This subset of the Altera document suite and my notes on using Quartus II in these pages only provides an introduction to the software, covering the basics necessary to program the CPLD used in MTXPlus+. For more comprehensive instructions, help and training materials, refer to the Quartus II Documentation page on the Altera website. 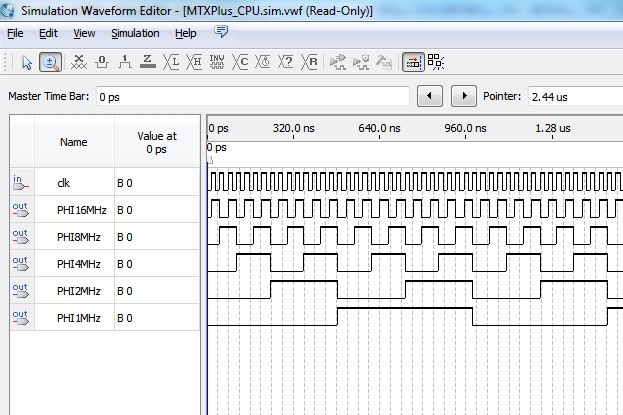 Rather than trying to go straight to development of the glue logic for MTXPlus, I thought that it was a better idea to experiment by developing some test programs that could be executed on a simple hardware test device. 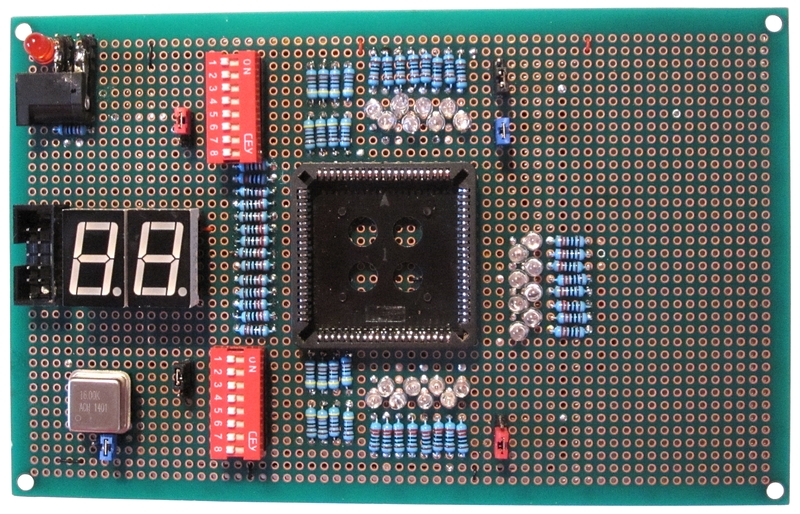 To be able to exercise the programmed logic and display the resultant outputs, a board with basic inputs and outputs from switches and LEDs will do the job, so I have built a hardware test bed that was used to develop my skills and test the MTXPlus CPLD logic. You can find the details on this page. 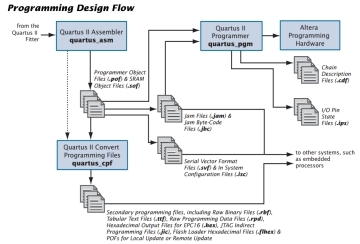 Quartus II provides a fully integrated suite of design components that are available for use during all phases of CPLD and FPGA design. The flow chart opposite illustrates the complete design process from creation of the design through to programming of the target device. 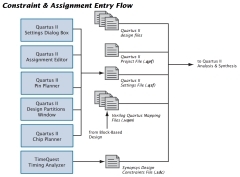 The various stages in the design flow are well explained in the Quartus II documentation. The Altera manuals should be the primary reference when using the product. They are comprehensive, that is very large, and many of the topics are not relevant to small, CPLD, designs such as mine. 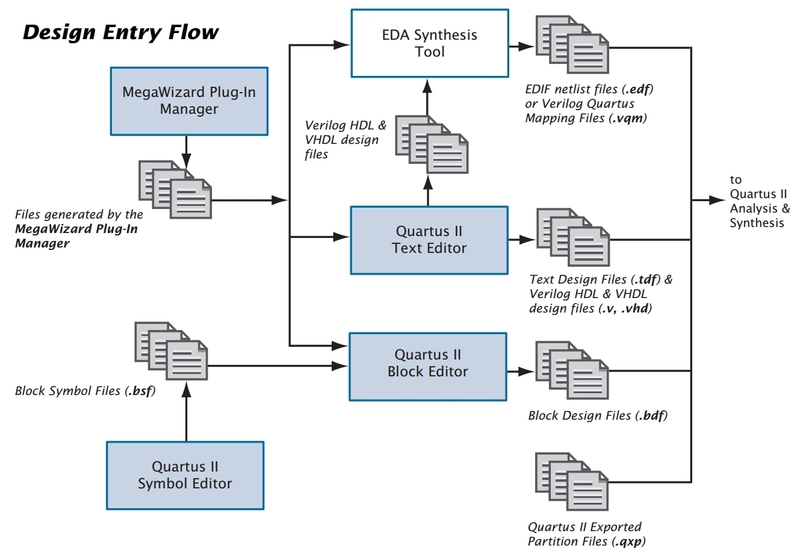 This page is intended to give a minimal overview of Quartus II and its use in MTXPlus+. 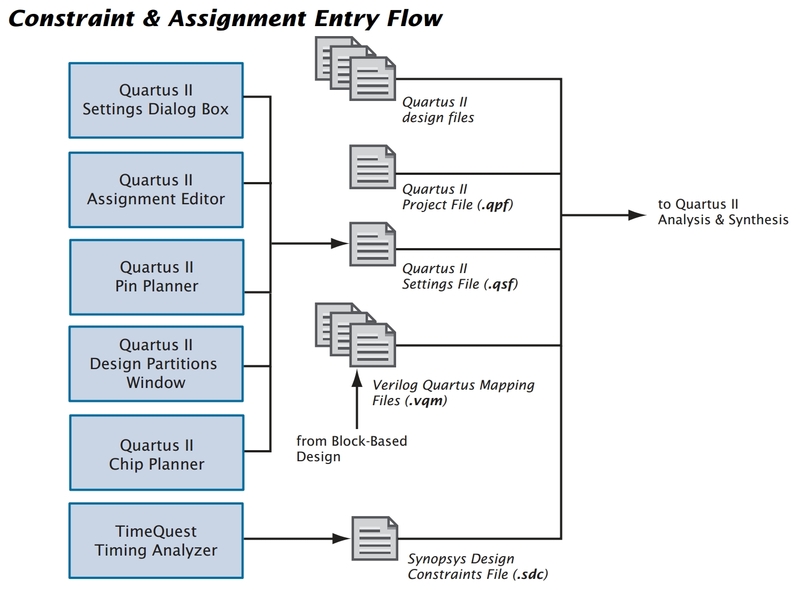 Quartus II supports a number of different design entry methods: Schematic entry, block diagrams and Hardware Description Languages (AHDL, VHDL, Verilog and System Verilog). As the diagram shows, a design can be developed using more than one type of design entry method. 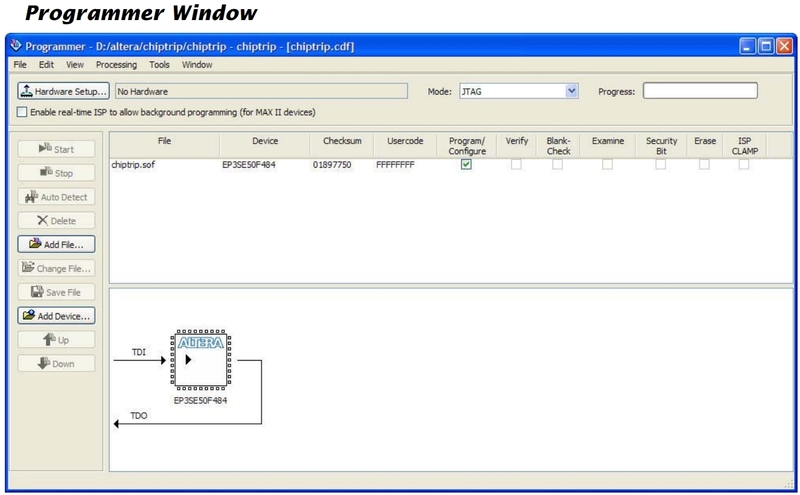 To begin with, I shall be using Schematic Entry - this should allow me to get some familiarity with Quartus II and the EPM7128S, including programming, compilation, simulation, I/O allocation and downloading to the CPLD through the JTAG interface. I may need to use text entry at some point to enter the memory decoding equations in one of the HDLs. 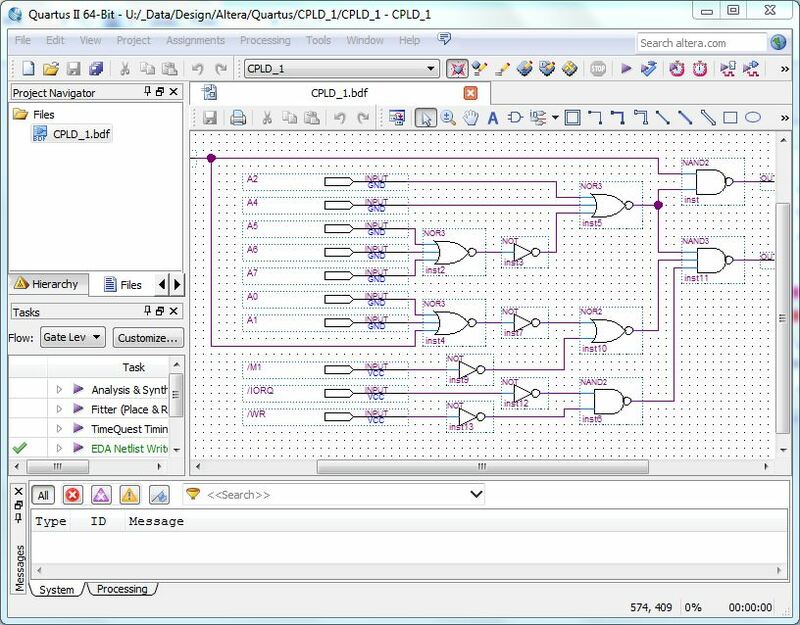 A typical example of a small schematic created using the Quartus II schematic editor. This is the easiest way to get started designing for the CPLD - hence the reason I'm using it ! 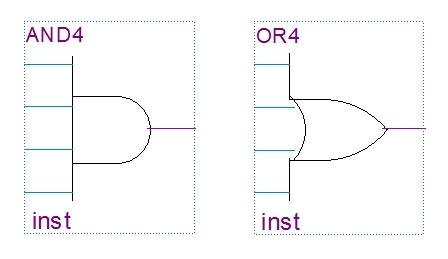 At the most basic level, the libraries include the basic logic gates such as AND, OR, etc., as well as a number of larger size gates that are not normally available in hardware, such as 12 input NAND gates and the like. 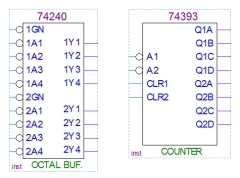 Going a step beyond basic logic gates, Quartus II also includes a library of standard 74 series logic components, e.g., the 74xx240 and 74xx393 shown here. These function blocks make it very easy to implement traditional logic designs inside the CPLD. 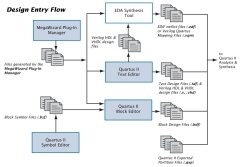 Quartus II also includes a large number of what Altera term "megafunctions", To quote from Altera, "Megafunctions are ready-made, parameterized, pre-tested blocks of intellectual property that are optimized to make efficient use of the architecture of the targeted programmable device." 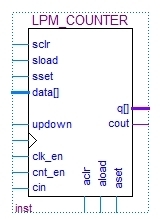 The megafunction blocks include "Libraries of Parameterised Modules" (LPM) such as the example shown of a LPM_COUNTER module. 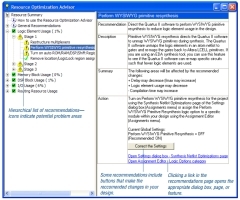 When added to a schematic the module is tailored to the application by adjusting the appropriate parameters. 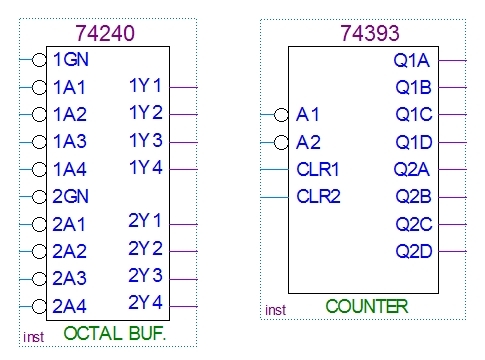 This is an example of an LPM_COUNTER instantiated in a schematic as lpm_counter0 with the parameters set to create a 5-bit up counter. 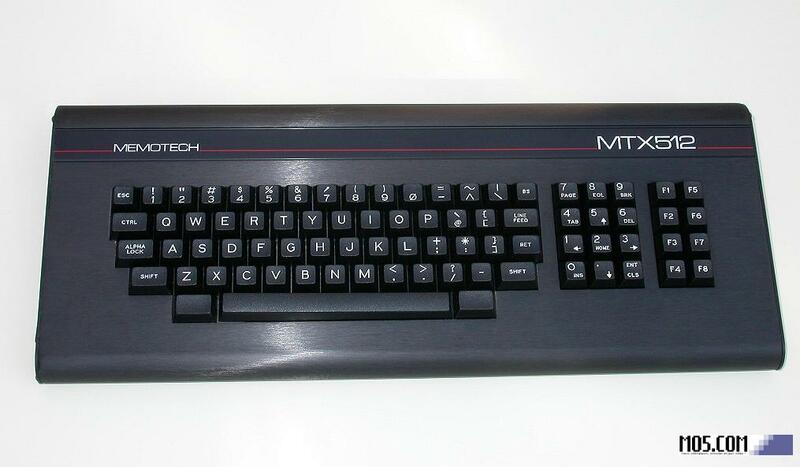 It is used here to produce sub-clocks from a 32MHz source clock. NB: This example does not confirm to Altrera's recommended design practices, but it does illustrate the use of an LPM. 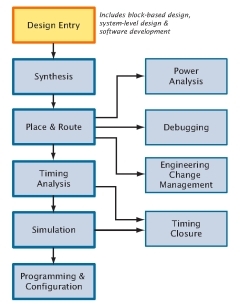 Once the design has been entered, the circuit can be tested in functional simulation. 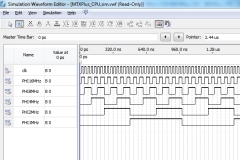 Test waveforms can be entered and used to verify that operation of the circuit is as intended. At this stage, there may be timing issues that would prevent the design from operating as intended once the device timing limitations are taken into account. Once the design has been entered, the Assignments menu in the Settings dialog can be used to specify initial design constraints, such as pin assignments, device options, logic options, and timing constraints. By default, during compilation, Quartus II is free to choose which pins on the device are used for the inputs and outputs in the design. 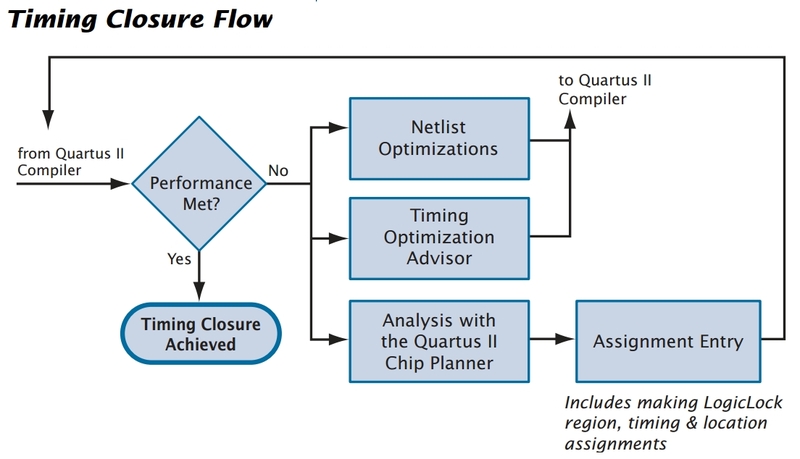 The TimeQuest analyzer determines the timing relationships that must be met for the design to correctly function, and checks arrival times against required times to verify timing. 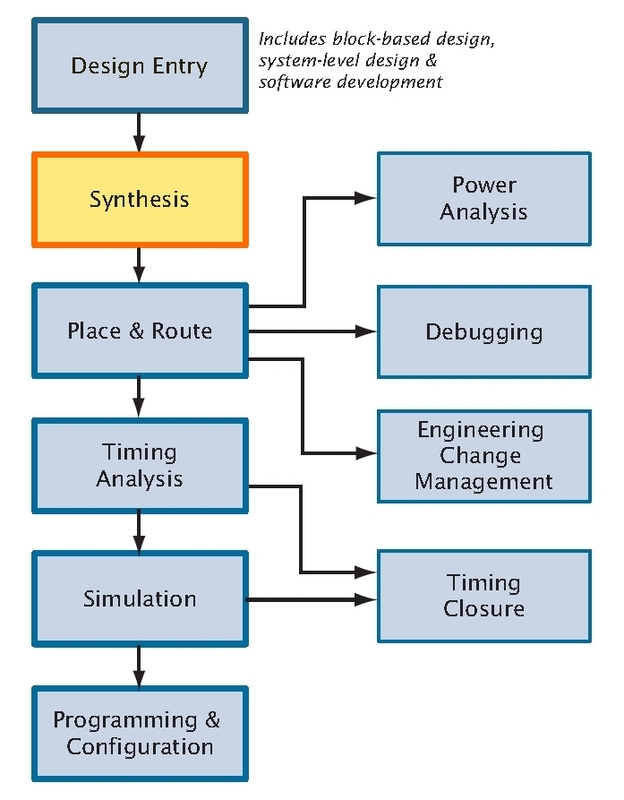 Synthesis is the process of converting the design into a circuit made up of the logic elements (LEs) from the CPLD (or FGPA). 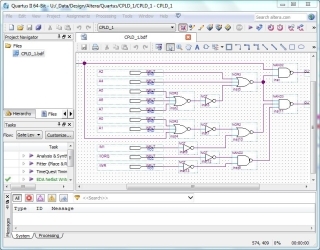 The software optimizes the logic by eliminating redundant terms and generating a netlist, (a connection list) that is a complete description of the circuit. 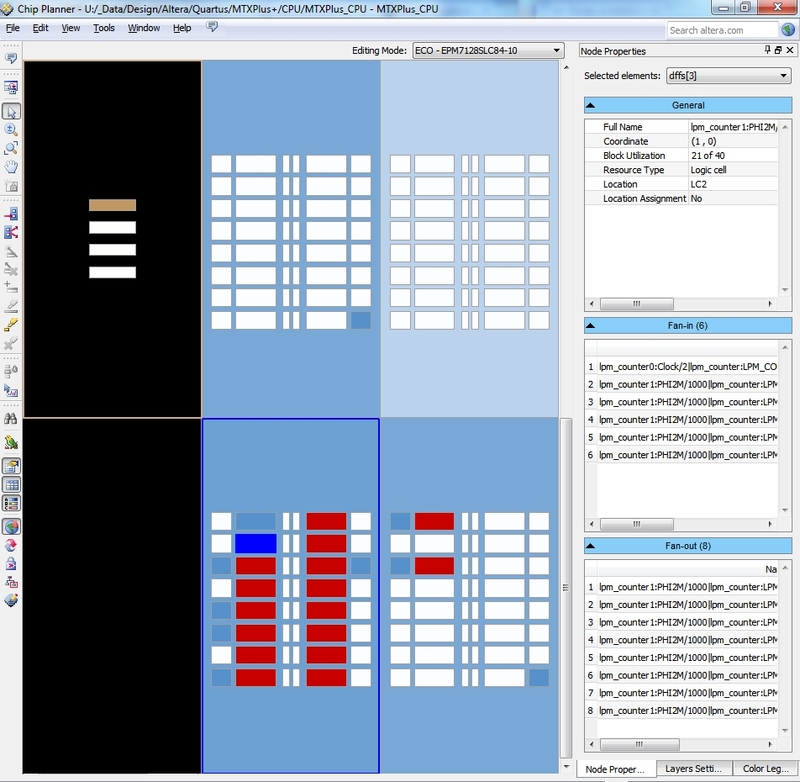 Quartus II includes a number of graphical netlist viewers, including the RTL Viewer shown here. 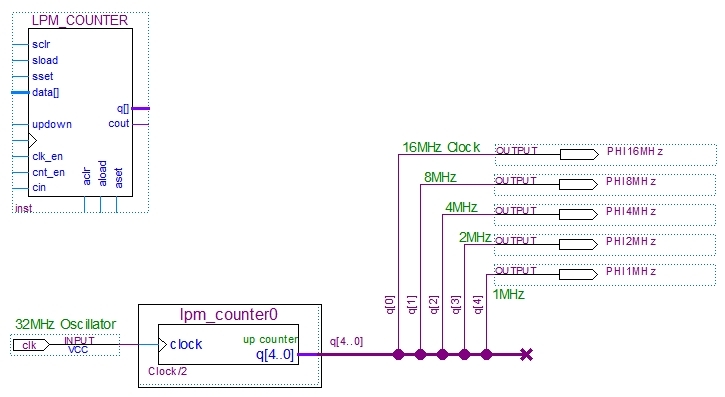 This is the top level netlist view of the LPM_COUNTER seen earlier, used to generate a number of sub-clocks from the source clock. By drilling down into the hierarchy, you can see how the logic is produced from the fundamental logic blocks, e.g., AND and OR gates and flip-flops etc. The next step is to map the netlist into the target device using the Quartus II Fitter. Using the database that has been created by Analysis & Synthesis, the Fitter matches the logic and timing requirements of the project with the available resources of the target device. It assigns each logic function to the best logic cell location for routing and timing, and selects appropriate interconnection paths and pin assignments. 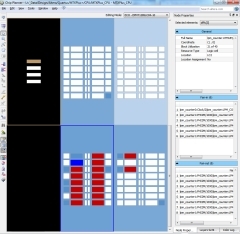 Quartus II includes several tools to aid in the analysis of the design compilation and fitting phases. The Message window and Report window provide fitting results information. 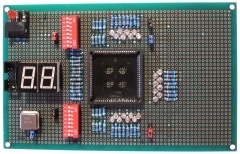 The Chip Planner (shown) provides a GUI that allows you to view the logic placement made by the fitter and/or user assignments, lock regions of logic and view routing congestion. 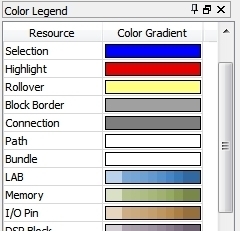 Resource elements in the chip planner are colour coded, the different colours representing different resources such as pin assignment status, logic cells etc. A changing colour gradient represents percent utilisation, with minimum utilisation at the left and maximum utilisation at the right. In the image above, the selected element is indicted by the blue block with the details on the selected element displayed in the right hand window. The Chip Planner also allows you to view the node fan-out and fan-in for specific structures, or view the paths between specific nodes. My MAX7128S Timing page gives a very brief overview of the timing parameters applicable to the MAX7128S. Using the constraints menu of the TimeQuest Timing Analyser, you can specify timing constraints for elements of the design, including I/O pins, clock settings, I/O delays. 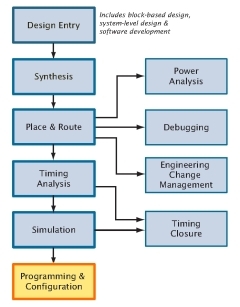 Once the initial timing analysis is complete, timing simulations are performed on the design to ensure that there are no problems due to the specific delays in the target device. The Timing Closure flow optimises the timing to meet the timing goals by controlling the Synthesis and Place & Route functions. The Quartus II Assembler module generates programming files that are downloaded to the device using the appropriate Altera programming hardare - in this case, the USB Blaster. When a design is successfully compiled, the Fitter's device, logic cell and pin assignments are converted into a programming image that can be loaded to the device. Quartus II Documentation page on the Altera website.